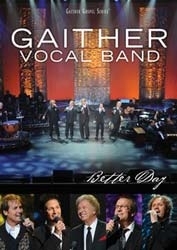 It s a new day for the Gaither Vocal Band! This exciting musical celebration, filmed before an enthusiastic live audience at the Majestic Theatre in San Antonio, Texas, offers a DVD debut of the group s brand new, all-star line-up featuring the voices of: Michael English, Wes Hampton, Mark Lowry, David Phelps, Bill Gaither... plus wonderful guest performances by The Isaacs and Jason Crabb. 2. Where Could I Go?